***2018 코리아 갤러리 위켄드 K-ART팸투어가 10월 4일(목) 15:00~18:00 사이에 이루어집니다. 중력의 위반, 자유로운 생각은 시공을 뛰어넘는다. 돌이 허공에 뜬 채 회전한다면 어떤 생각이 들까. 암석으로부터 떨어져 나온 작은 크기의 덩어리라 하더라도 돌은 질량을 지니기 때문에 중력의 법칙으로부터 자유로울 수 없다. 작고 평평한 조약돌을 주워 수면 위로 거의 수평으로 던질 때 돌이 물속으로 가라앉지 않고 몇 차례 튕겨나가는 것은 돌의 속도와 회전수, 물과 돌 사이에 일어나는 표면장력이 작용했기 때문이다. 그러나 돌은 이내 물속으로 가라앉는다. 그런데 어떤 외부적 자극이나 지지대 없이 돌이 공중에 떠서 돌아간다면 많은 사람들은 신기하게 여기고 표면과 돌 사이의 공간에 손을 넣어볼 수도 있을 것이다. 그러나 육중한 기차가 바퀴로 철로 위를 이동하는 것이 아니라 지면에서 뜬 채 고속으로 달리는 자기부상열차의 상용화를 앞두고 있으므로 중력에 대항하여 안정된 위치 내에 물리적인 접촉점이나 다른 지지대 없이 자기장만으로 물체를 띄우는 공중부양(levitation)이 결코 낯선 것은 아니다. 류정민은 이 원리에 착안하여 자기부상 모듈을 사용해 돌을 공중에 띄워 회전하는 작품을 제작했다. 허공에서 돌고 있는 이 물체는 자연에 실재하는 돌이 아니라 만들어진 돌, 즉 위장된(camouflaged) 돌이자 모조된(simulated) 돌이다. 그것은 류정민이 스티로폼으로 돌의 형태를 만들고 그 위에 돌을 촬영한 사진을 오려붙이는 집요하면서도 지독한 과정을 거쳐 만들어낸 ‘진짜 같은 가짜’, 즉 실재의 그림자(simulacrum)이다. 사진작업으로부터 출발한 작가는 수십 장으로부터 수천 장에 이르는 사진을 합성하여 낯설면서도 아름다운 공간을 창출한 바 있다. 반복적으로 병렬, 합성한 사진은 현실 너머에 있는 풍경일 뿐만 아니라 작가의 심리에 의해 그려진 지형도이기도 하다. 이처럼 우리의 지각을 교란하며 사진의 평면 공간 속에 기이하면서 몽환적인 세계를 담던 그는 5년간의 실험을 거쳐 2016년 성곡미술관에서 열린 ‘코리아 투모로우’에서 처음으로 사진조각을 발표했다. <EIN STEIN-기웃거리는 상상, 머뭇거리는 상상>이란 제목으로 발표한 일련의 설치작업은 스치로폼으로 만든 돌이 벽이나 문, 혹은 천장에 매달려 있거나 사각뿔 위에 위태롭게 놓아둔 것이었다. 일상에서 흔히 볼 수 있는 문과 돌의 기이한 만남은 작가가 걸어놓은 마술과도 같은 데페이즈망(dépaysement)의 세계로 이끌고 있다. 더욱이 밀도가 높아 바닥에 놓여있어야 할 돌이 천연덕스럽게 문 위에 매달려 있고, 가변적인 그림자는 얇은 철판으로 대체돼 공간을 예리하게 구획하고 있다. 철판을 이용한 인위적 그림자는 빛의 량이나 각도에 의해 변할 수밖에 없는 그림자가 견고하고 단단한 물질처럼 공간을 점유하고 있다는 점에서 관계의 역전에 대해서도 생각하게 만든다. 모든 물체가 작고 단단한 알갱이로 이루어져 있다는 기본개념으로부터 출발한 뉴턴의 고전역학이론에 따르면 외부의 힘의 자극, 즉 속도가 변하지 않는 한 물체의 공간이동은 불가능하다. 그러나 양자역학의 세계에서 전자는 입자인 동시에 파동인 까닭에 임의의 시간과 장소에 확률적으로 존재할 수 있다고 한다. 허공에 뜬 채 회전하고 있는 돌이나 벽이나 문에 붙어있는 돌은 스티로폼 속에 숨겨놓은 자석이 서로 다른 극을 끌어당기는 원리를 사용한 것이므로 영자역학과는 상관없지만 우리의 평범한 지각을 전복시키는 것임에는 분명하다. 그렇다면 그는 왜 돌에 주목했을까. 그 동기가 재미있다. 독일에 유학했던 작가는 상대성이론으로 잘 알려진 아인슈타인(Albert Einstein)의 이름이 독일어로 하나의(eins) 돌(stein)이란 뜻을 지니고 있다는 사실을 발견하고 무거운 돌이 중력의 법칙을 벗어나 자유롭게 공간을 점유하는 작품을 착안했다고 한다. 말하자면 발상의 전환이 가져오는 유쾌하면서도 도전적인 시도를 위해 고전역학을 위반한 것이다. 하나의 돌은 하나의 생각을 상징한다. 각 돌들이 지닌 형태, 색깔, 크기는 생각의 차이를 나타낼 뿐만 아니라 생각의 자유로움을 의미한다. 한편으로 스티로폼으로 형태를 만들고 그 위에 돌을 촬영한 사진을 잘라 마치 퍼즐을 맞추듯이 섬세하게 붙이는 노동의 과정은 현상학자인 후설(Edmund Husserl)이 자연적인 태도를 괄호 안에 넣어 멈추도록 함으로써 순수한 체험, 순수한 의식을 획득할 수 있다고 주장한 판단중지(epoché)와도 같은 몰입의 과정이자 또한 순수한 유희의 과정이기도 하다. 나아가 돌을 만드는 과정은 마치 주변에 흩어진 돌을 모아 하나하나 쌓아올리는 수행이나 명상과도 연결할 수 있을 것이다. 이 만들어진 돌들이 자석의 힘에 의해 서로 당기거나 미는 것은 생각의 충돌, 결합, 확장을 나타낸다. 무엇보다 비정형이면서도 부드러운 형태의 자갈은 서로 다르지만 닿고 부딪치면서 형성된 것이란 점에서 우리의 생각 또한 마모의 과정을 거치면서 다듬어진다는 사실을 함축하고 있다. 그렇다면 이 돌은 생각을 시각화한 것이자 생각의 자유로움을 표상한다고 할 수 있다. 장애물에 부딪치면 방향을 바꾸는 강아지의 놀이기구나 자동청소기에서 착안하여 돌이 서로 겹쳐진 의자 사이를 굴러다니도록 만든 작업 또한 생각의 자유로운 운동을 떠올리게 만들며, 자석을 이용해 쌓은 돌탑은 게놈(genome)의 염기서열을 연상시키기도 한다. 인간의 생각을 읽을 수 있을까? 거짓말탐지기, MRI 스캔, EEG 파동 등의 기계에 의해 지극히 단순한 생각만 읽을 수 있을 뿐이므로 인간의 생각은 여전히 미지의 영역이다. 그래서 생각은 신비롭고 오묘하다. 각자가 가진 다양한 생각은 돌의 크기나 형태처럼 천차만별이므로 다른 사람의 생각을 읽기보다 그것의 다양성을 인정하자는 작가의 여유가 다양한 돌을 통해 나타나고 있다. 즉 돌로 공간을 연출하는 행위를 통해 나의 생각과 다른 사람의 생각의 차이를 받아들이고 있는 것이다. 결론적으로 류정민은 현대사회에서 미디어가 마치 융단폭격처럼 제공하는 엄청난 량의 정치, 경제, 사회문제 등의 정보홍수 속에서 꼬리에 꼬리를 물고 이어지는 생각을 보다 가볍게, 그럼으로써 자유롭게 시각화하기 위해 돌로 표상된 생각을 공중에 매달거나 벽면에 부착했다고 할 수 있다. 중력의 위반, 그것은 생각의 자유로움이 시공을 뛰어넘을 수도 있음을 암시한다. 그 중심에 아인슈타인이 있었고, 그가 했던 ‘사고실험’이 류정민의 작품에서는 공간 속으로 확장된 생각으로 나타나고 있다. 누가 계란을 세울 수 있을까. 콜럼부스는 계란을 세웠다. 그러나 실험에 의해 누구든지 계란을 세울 수 있다는 사실이 증명되었다. 단지 끈질긴 노력과 시간이 필요할 뿐이다. 돌을 공중에 띄우거나 벽면에 부착한다는 발상은 자유로운 생각이 작동할 때 가능하다. 류정민의 작업은 그 발상의 자유로움이 제공하는 시각적 즐거움이 지각을 확장할 수 있음을 증명하는 것이기도 하다. ‘현자의 돌(lapis philosophorum)’ 은 전설이나 연금술에만 존재하는 것은 아니다. 다르게 생각하기, 그것이야말로 현자의 돌을 현실에 존재하게 만드는 가능성이자 힘이다. What might one think upon viewing a stone floating and revolving in mid-air? Regardless of its size, any stone has mass and is thus inevitably under the influence of the law of gravity. When one throws a small and flat cobblestone across the surface of water, the stone skips a few times because of its speed, spin count and the surface spin effect. Yet it does not take long for the stone to eventually sink. If a stone manages to stay afloat and spin without any external stimulation or support, people would find it spectacular and slide hands through the space between the surface and the stone. Though amusing, such concept of levitation, the state in which gravity is repelled and objects float from the effect of magnetic fields, is not totally unfamiliar, as high speed maglev trains that run on magnetic fields rather than on heavy wheels are expected to be commercialized in the near future. Ryu Jungmin was inspired by this idea and created a floating and spinning stone using a maglev module. 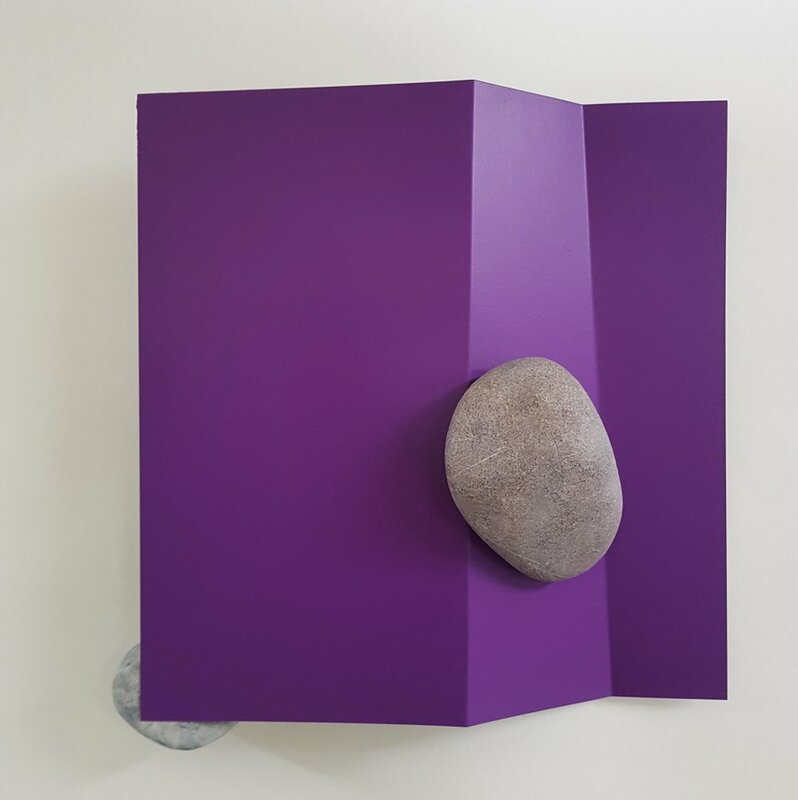 Ryu’s floating and spinning stone is not a stone found in nature, but an artificial one that is ‘camouflaged’ and ‘simulated.’ The artist sculpts it from Styrofoam, and then glues on cutout photos of stones and rocks. The Styrofoam stone resulting from this tedious process is a fake that appears real—in other words, it is a simulacrum. Some time ago, Ryu created a space unfamiliar yet beautiful to the audience by combining dozens, hundreds, and thousands of photos. Her repeatedly aligned and combined photos were not simply imagery beyond reality but also photographic topographies created by her psychological state. In this way, the artist confused our senses and perceptions while conveying eccentric and dreamy worlds in the two-dimensional image plane of his photos. After five years of experimenting, Ryu Jungmin finally presented her photographic sculptures for the first time atKorea Tomorrow 2016, which was held at the Sungkok Art Museum. A series of installations titled <EIN STEIN- 생각의 생각> consisted of Styrofoam stones attached to a wall or a door, hanging from the ceiling, or nervously placed on the tip of a pyramid. The joining of an ordinary door and a stone leads the audience to the world of dépaysement, a magical experience the artist intended. Moreover, a stone, which in theory, should sit on the floor given its density, nonchalantly hangs on an angled door, while shadows that should change with time have been substituted by thin metal plates that keenly section the exhibition space. Natural shadows change shapes depending on the amount or the angle of light, but the fact that these constructed shadows occupy the space like robust and sturdy objects allows us to consider the reversal of relationships. According to Newton’s theory of classical mechanics, objects are composed of small and solid particles and cannot be moved without the intervention of an external force. In other words, an object may move only when there is change in velocity. However, in the realm of quantum mechanics, electrons are both particles and waves, and therefore can exist in probability at a random time and location. Ryu Jungmin’s Styrofoam stones that float and revolve in air or are attached to a door are embedded with magnets. This proves that the state of her stones has nothing to do with quantum mechanics; yet the ways in which the artist installs the stones certainly upend our common perceptions. Why did Ryu Jungmin select stones as subjects of her work? It all began from a fun realization. The artist studied abroad in Germany, and during her years there, she realized that Albert Einstein’s last name is a compound of ‘eins’ and ‘stein,’ which mean ‘one’ and ‘stone’, respectively, in German. That realization inspired her to devise stone installations that reverse the law of gravity and freely occupy the space. In other words, the artist violated classical mechanics for her playful yet challenging attempt at shifting ways of thinking. A single stone symbolizes a single idea; then the shape, color and size of each stone represent not only the differences between each idea but also the unrestricted freedom of thought. The process of sculpting Styrofoam, cutting out stone images, and then delicately gluing them on the sculpted Styrofoam is simultaneously a process of pure playfulness and a process of immersion—one similar to the concept of epoché(or bracketing), developed by the phenomenologist Edmund Husserl. According to Husserl, epoché is the act of suspending judgment about the natural world to focus on experience and consciousness. Moreover, Ryu’s stone-making may also be understood in connection with stone-balancing or meditation. Her magnet-embedded stones that push away from one another or are pulled together represent the clash, convergence, and expansion of ideas. Stones are irregular in shape yet are smooth on the surface from countless collisions and weathering; likewise, our thoughts are polished and refined through agreements, disagreements and awakenings. In that sense, stones are reflective of how our thoughts come into being. They are visualizations of human thoughts and representations of the freedom of thought. In another stone installation, Ryu Jungmin designed stones so they roll through or roam around stacked chairs like robot vacuum cleaners and toy dogs. Yet again, her stones remind us of the freely wandering nature of human thinking. On the other hand, another stone installation in which a stack of stones are held together by magnets, even recall genomic sequences. Can human thoughts be read? Machines such as lie detectors, MRIs and EEGs can reveal our thinking to a certain extent, but there is only so much they can grasp, meaning that human thoughts are unchartered territories. That is why thoughts are subtle and mysterious. Each individual’s thought is unique from one another’s, just as each stone is unique in its own way. Through her sculptural installations, Ryu Jungmin implies that we must learn to accept the diversity of human thought rather than try to read them. In other words, the artist is demonstrating his acceptance of differences between thoughts through the act of installing stone figures. In essence, Ryu hung stones or attached them to walls to lightly and freely visualize the endless waves of thoughts that emerge from the overwhelming flood of information provided by media in the contemporary society. The violation of gravity indicates that freedom of thought can transcend space and time. Einstein was at the center of such thinking and her thought experiments extended into space in Ryu Jungmin’s installations. Can an egg stand without any support? Columbus was able to balance an egg, and later experiments revealed that anyone can balance an egg—it just requires time and effort. When one thinks outside the box, making a stone float in air or having it attached to a wall without falling are no longer improbable. Ryu Jungmin’s work is evidence that visual pleasure provided by the liberty of thought can even expand one’s horizons. The philosopher’s stone (lapis philosophorum) does not exist only in legends or alchemy. Thinking differently is the key that brings the philosopher’s stone into reality.